This lady beetle was photographed in the Sonoran Desert by Laurie Nessel. 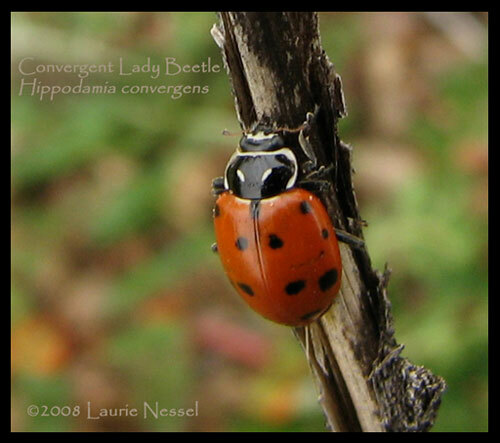 ‘Convergent’ refers to the two slanting white lines on the shiny black pronotum. This is the most abundant lady beetle in the Sonoran Desert spring. It is also the most important species on farms and in backyard gardens. By May the beetles begin a local migration to the cooler mountains. Great clumps of thousands upon hundreds of thousands can be found around high elevations clinging almost motionless to tree trunks in the shade. They are resting until the climate in the desert cools and becomes more favorable to their primary prey, aphids. So, purchasing these beetles for release in your summer garden is a waste of money ... they will immediately fly back to the mountains. Two other common Lady Beetles in the Sonoran Desert are Seven-spot Ladybird (Coccinella septempunctata) and Ashy Gray Lady Bird (Olla v-nigrum). 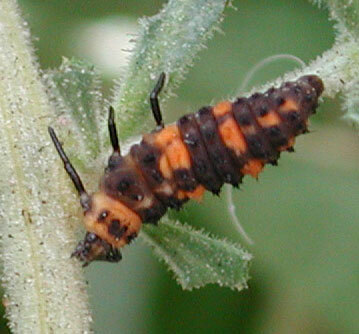 The larval stage of the lady bird is grub-like with short legs and predates great numbers of aphids and other soft-bodied insects.